Pleasanton Police Officer Justin Granado was alerted to a vehicle on August 2 that was known to frequent drug locations in the city. Officer Granado encountered the vehicle in the 1700 block of W. Oaklawn and noticed that the vehicle registration was expired. A traffic stop was initiated at the location and the vehicle pulled in and stopped at a local business. The driver, identified as Alexander Grendys, abruptly exited the vehicle throwing trash onto the ground and raised his arms above his head, a known tactic used to distract officers. While Grendys engaged in this behavior, the passenger, William Sivley, slid into the driver’s seat of the maroon colored 2015 Dodge Ram 3500 and fled the stop eastbound on Oaklawn at a high rate of speed. Officer Granado pursued the vehicle which continued toward US281/Main Street. The vehicle entered the right turn only lane and failed to navigate the right turn, crossing an island as it continued eastbound where it collided with another vehicle that was stopped for a red light at Oaklawn/Hwy 97. The impact was massive, yet Sivley was capable of fleeing the wreckage on foot toward the south. Pleasanton PD Officers gave chase and located Sivley in a large drainage ditch. After attempts to get Sivley to surrender peacefully, he refused and an electronic control device was deployed. Sivley was then apprehended without further incident. Further investigation discovered that Sivley was armed with a semi-auto pistol that he concealed in the ditch as he fled. Additional officers responded to aid in the incident and discovered that the other driver, identified as Jackie Bynum, was seriously injured from the collision and remained in his vehicle. Additionally, the 2015 Dodge Ram 3500 had begun to burn and was in close proximity to Bynum. Officers responded, removing Bynum from the vehicle. 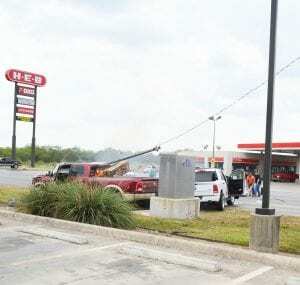 Citizens at the scene acted as heroes acquiring fire extinguishers and extinguished the fire prior to the Pleasanton Fire Department’s arrival. A streetlight at the intersection was severed from the collision. The Pleasanton Fire Department assisted in securing the area around the streetlight and collision. Bynum was treated by EMS and later Airlifted to the University Hospital in San Antonio. Bynum, who is a crop adjuster, had been working in south Texas. At the time of the incident, he was on his way to Uvalde to spend the night then was heading home to Lubbock. “I cannot tell you how amazing everyone has been to us,” said his step-daughter, Kerri Pope of Lubbock. “The Pleasanton Police Department came to the hospital to explain what happened and to answer any questions. “ Kerri and her mother arrived in San Antonio and said they were met with much kindness from strangers including an Uber driver that picked them up at the airport and people at an AT&T store and their hotel. She said that Bynum as a result of the wreck suffers from a broken neck, broken ribs, broken hand and a concussion. He also has a broken ankle which was operated on Monday and also had a tube placed in his chest. Pope had hoped to get him transferred to a hospital in Lubbock for the surgery so his family can rally around him and her mom. “He will not be going home for a while,” Pope stated Tuesday. She said that even with the severe injuries Bynum who turns 65 next month is in good spirits and while overcome by his injuries he is also overwhelmed with all the love and kindness shown to him. The follow-up investigation discovered that William Sivley was a fugitive from the State of Michigan, wanted for Absconding Parole on original charges of Armed Robbery and Assault with Dangerous Weapon convictions. 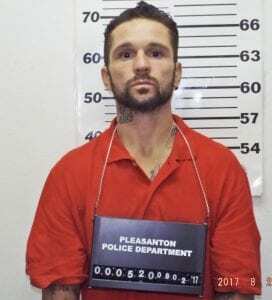 He was additionally charged by the Pleasanton Police Department for Evading Arrest in a Vehicle (Causing Serious Injury), Unlawful Possession of Firearm by Felon, Failure to stop and Render Aid (Accident), Tampering with Physical Evidence and Resisting Arrest. Investigators further established probable cause to believe that Alexander Grendys committed the offense of Hinder Apprehension. Sivley and Grendys were booked at the Atascosa County Jail on these charges. 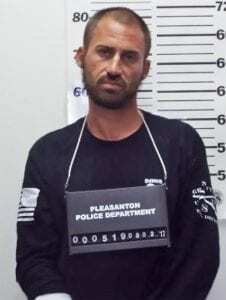 William Sivley was captured by police after he fled the scene of the collision. Sivley plowed the Dodge Ram into a white truck injuring Jackie Bynum. Passers-by pulled Bynum to safety from the wreckage as the Dodge caught fire. Bynum suffered a broken neck, ribs, hand, a concussion, a broken ankle that required surgery, and a tube inserted into his chest. He remains in stable condition at University Hospital in San Antonio.